Keds offers The Complete Keds Sneaker Collection. Shop for fashionable shoes, boots, wedges, pumps and sandals and grab huge discount on your online order. Bookmark this page & stay updated with these exclusive Keds promo codes. Hot Keds Discount: Exclusive sale at Keds - Save up to 50% on select tennis shoes. Don't miss out this offer. Promotional Keds coupon code: Purchase stylish shoes & accessories of at least worth $15 to get free shipping on your order at Keds. Hurry, this offer may expire soon. Hot Keds Discount: Receive savings of $40 on combo purchase of metallic dusted leather pony, hat & bag. Click here to get instant savings. Promotional Keds coupon code: Buy and save $15 on this stylish beanie at Keds. Shop now! Exclusive Keds Deal: Keds is offering a discount of $11 on select cell phone cases. Visit Keds for exciting offers. Promotional Keds coupon code: Purchase fashionable shoes for $50 or less at Keds. Go for this offer before it runs out. Keds is a retailer of fun and practical shoes, founded in 1916. Their iconic rubber sole and canvas upper design is instantly recognizable around the world. The Keds partnership with Taylor Swift brings fresh, new, Swift-inspired designs to Keds stores evrywhere. 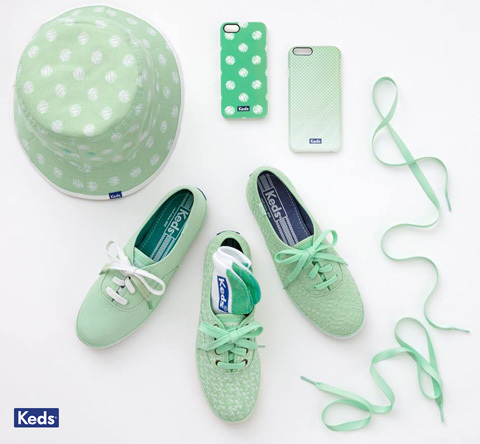 More than just their trademark footwear, though, Keds also offers an assortment of accessories and men’s shoes as well. Keds also sponsors the Brave Life project, to inspire and empower girls around the world. You can get free shipping on all orders, and free return shipping as well! Keds is offering Free Keds Shoe Laces with any Champion Originals shoe purchase. Keds always has great styles on sale. Check out the Sale section at their website. To shop more on latest collection of shoes from top brand names, visit our site which has huge collection of coupons. Shop for all your favorite Keds products using the category menus along the top of the page. Select the product you would like to purchase, pick colors and sizes as needed, and click on Add to Cart on the product page. Your Cart will be updated – you can continue shopping on the site, view your Cart, or click on Checkout to begin checking out. On the Checkout page, enter your email address, your shipping address, phone number, and then select your preferred shipping method. To proceed, click Continue Checkout. Enter a billing address, or specify to use the shipping address as the billing address. Under the billing address, a field is labeled Promotional Code. Click on the box asking Do You Have a Promotional Code? Enter your Coupon Code in the field that appears, and click Apply. Enter your gift card and/or payment information at the bottom of the page. PayPal and all major credit cards are accepted. To proceed, click Continue Checkout. Review your order information, and then finalize your order by clicking on Submit Order. Check out the video below for a look at the latest in Keds style, including a message from Taylor Swift on how to Own Your Style! Subscribe to the Keds channel on YouTube to watch more behind-the-scenes footage, detailed looks at new products, and information about what makes Keds shoes unique. Keds Gift Cards are available as physical cards or E-Gift Cards. Both cards are available in $25, $50, $75, $100, and $250 denominations. Cards can be mailed for free or sent instantly via email. Keds offers enrollment in their online newsletter to receive special VIP offers, new product announcements, and special freebies for members only! Sign up by entering your email address at the bottom of the page. Also, for more such money savings offers you can check out at Shi by Journeys. Keds ships to anywhere in the United States [including Alaska and Hawaii], and offers many shipping method choices. You can have your order shipped via Standard Shipping to arrive two to six business days after ordering, Express Shipping to arrive within two business days, or Overnight Shipping to arrive the next day. An extra charge is applied to all orders to Alaska, Hawaii, and US Territories. Shipping prices vary with the total cost of all products ordered, starting at $2.00 for Standard (Standard Shipping is free on all orders over $14.99), $8.00 for Express Shipping, and $18.00 for Overnight Shipping. Keds offers replacement, exchange, or a refund of your purchased product if you are not completely satisfied. LIKE Keds on Facebook to get an early peek at new products and announcements from Keds! The Keds page also offers special promotions, contests and exclusive photos. FOLLOW Keds on Twitter to stay up-to-date on the latest news from Keds and participate in conversations using the hashtag #KEDS. FOLLOW Keds on Pinterest to keep up with new seasonal products and browse their product selections and creative shoe concepts. FOLLOW Keds on Tumblr with the Bravehearts website! FOLLOW Keds on Instagram to check out products and interact with other Keds fans.